THE FACULTY, Robert Rodriguez, Kevin Williamson, 1998. 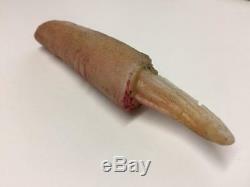 Furlong's (Jon Stewart) screenused severed finger and alien tentacle prop. 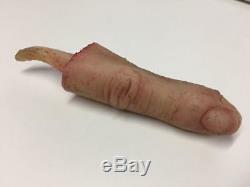 This life-like severed finger is made of rubber and is 4 1/2" x 1" with an alien tentacle sticking out of the wound. 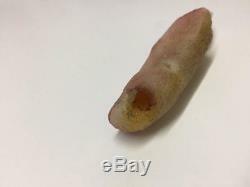 The finger is grimy and still features fake blood, and is missing a small chunk of skin. There is a round hole that runs straight through the finger, possibly for a blood tube. The item "THE FACULTY, Furlong's (Jon Stewart) finger/alien tentacle movie prop horror" is in sale since Sunday, October 1, 2017. This item is in the category "Entertainment Memorabilia\Movie Memorabilia\Props\Originals". The seller is "richardfinlaycollection" and is located in Dublin.